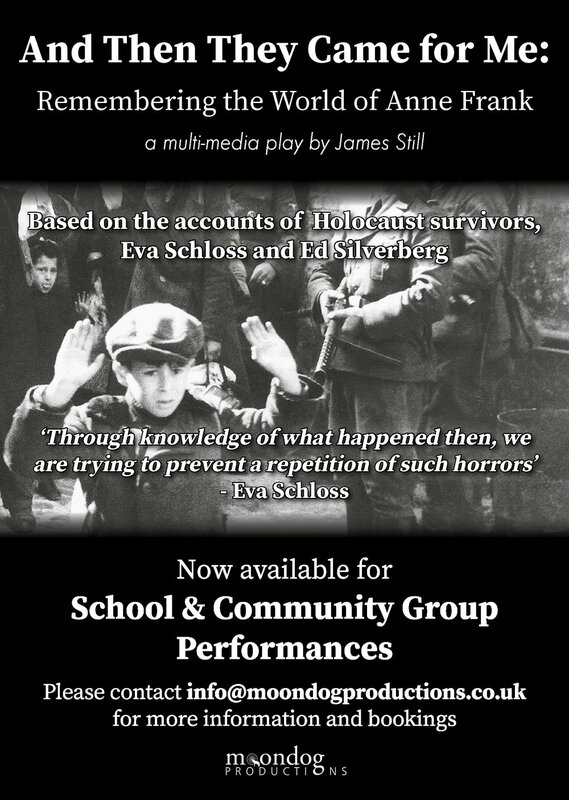 And Then They Came for Me is a unique experience for students… a multimedia play that combines videotaped interviews with Holocaust survivors, Eva Schloss and Ed Silverberg with live actors recreating scenes from their lives as teenagers during WW ll. Ed was Anne Frank’s first boyfriend. Eva was the same age and lived across from Anne in Amsterdam until she and her family were arrested by the Nazis and sent to concentration camps. More than 1.25 million people were killed in Auschwitz-Birkenau where Eva and her family were sent. Part oral history, part drama action, part remembrance, this play brings to life what happened after The Diary of Anne Frank ends. The ensemble-driven play breaks new ground and has been acclaimed by audiences and critics in world-wide productions. The play really made me think about unfair life was at the time towards Jews. It was really educational and I learnt a lot from it. Also the actors were amazing and transported me back into that time. I loved it! I thought that the play had a very good, clear structure. Almost all of the info was true so it helped us to understand what actually went on. Very informative and I thoroughly enjoyed it just like everyone else I’m sure. I couldn’t really make any negative points at all!!! 'We all think of our teenage dramas as such huge problems. When we lose friends we think “How can anything be worse than this?”. Homework, exams, revision are all classed in our heads as a big deal. I felt like this but watching ‘And then they came for me’ has genuinely changed my perspective on how I think of things. This heart-wrenching story about four children around our age and the effects the war had on them was, in one word: inspiring. The script was carefully written so that we as an audience could comprehend their stories without the need for gore. The way that two of the actors playing the characters of Eva and Ed were able to speak their exact words whilst also leaving pauses for actual interviews with the actual Eva and Ed to be played in the background was very moving. 'The character study of a child in the Hitler Youth Movement provided a fresh perspective on a subject not commonly spoken of. We were able to understand that from the age of 7, Hitler’s morals had been drilled into their heads. However, the most tear-provoking story this character told was when he was given a puppy to look after for six months, he was told to care for it and to protect it as a way to teach the children responsibility. Then, one meeting they were all ordered to strangle their puppies. They were told that they would not be real Germans if they disobeyed this order. That was when I began to understand that everyone was emotionally damaged in that sickening war. 'The portrayal of Anne Frank was touching as we could see her personality so clearly, which is an experience I feel we cannot get from any book or documentary. Anne’s relationships with all the characters was well defined which must have been challenging when the play was only performed by four actors! When I first knew that there was only four actors playing a multitude of characters I began to believe that I would become easily puzzled. However, this was far from the case as the actors were so skilled in their ability to be able to change their tone, their body language, and the movements with every character they played. 'Yet, the most emotional part for me was when we were able to talk to Eva Schloss herself. At the end of the performance the audience was given the opportunity to ask her questions to which Eva, 88 years old, gave inspirational answers. Eva was taken on her 15th birthday by German officers. From there she was interrogated, tortured and taken to a concentration camp. Eva and her Mum were lucky enough to survive on hope and good luck (Eva’s words) whereas her father and brother died. Eva raised the awareness that inhumane acts are still happening today all over the world and many are just turning our heads, dis-regarding it. 'I thought the performance was excellent and the students were very moved and impressed with the whole event.